You are a Cepter, a being able to summon creatures and cast spells using magical cards. Earn more cards by playing through the Story Mode, taking out the computer controlled enemies as you move around the game board. As well as multiplayer battles, you can also take part in co-operative games against a strong computer player. 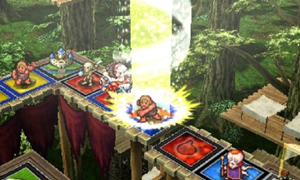 The Culdcept series first appeared on Sega Saturn and is considered to have a steep learning curve. To overcome this, this game features extensive tutorials for beginners and advanced players.